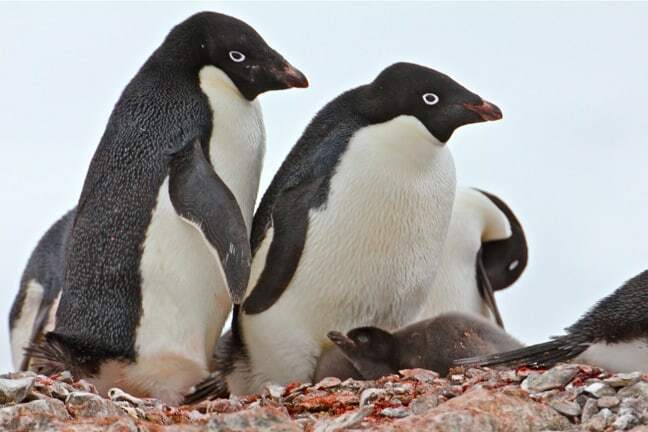 He was right about the first point: We saw thousands of penguins during our 5 days in Antarctica, including 3 different species, mama penguins with eggs, adorable baby penguins and even a rare albino penguin. But he was dead wrong about the latter, as we NEVER grew tired of watching them. 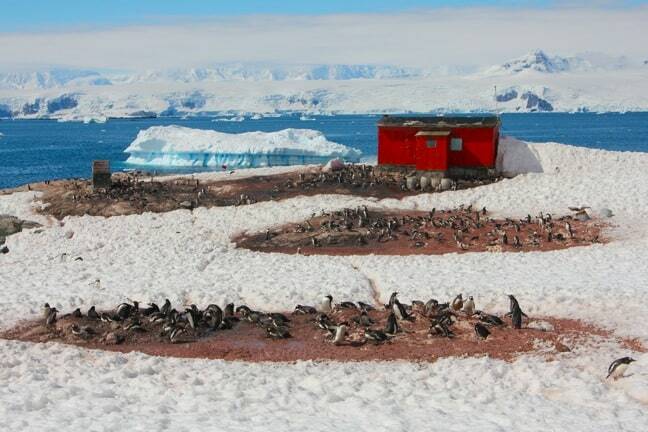 You don’t have to wait very long or look very hard to find the Penguins of Antarctica. 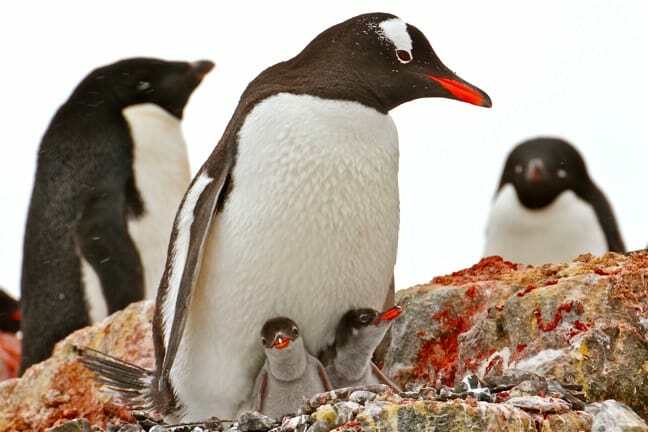 We spotted our first colony on the shore of Half Moon Island before our Zodiacs had even landed, and were surprised to see two different species– the smaller Chinstrap Penguin (known for their distinctive facial markings) and the reddish-orange-billed Gentoo Penguin– intermingling there. The penguins didn’t seem to care much that we were there, but our guides ensured we maintained a respectful distance. Not all of the penguins were so accommodating as to greet us right at the beach. 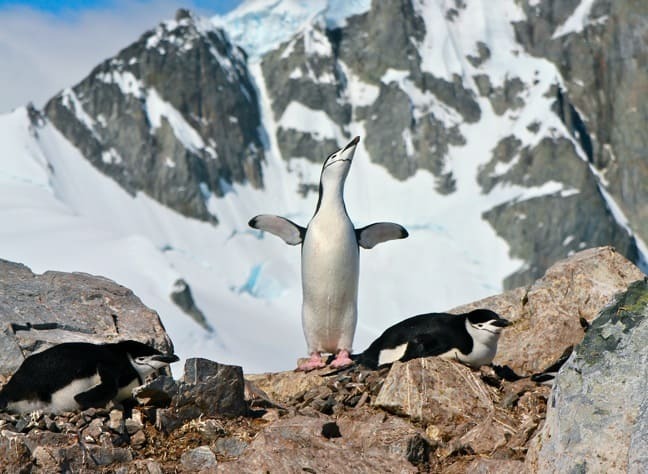 Sometimes their colonies were located at the top of steep mountains around 1000 feet up, requiring arduous hikes through deep snow. One wrong step and you’d sink in up to your knees. But when you finally got to the top, the views were always breathtaking. It was fascinating to sit and watch the penguins for an extended period of time. Some just laid there, basking in the afternoon sun. Some hiked up and down the mountains, going to the ocean to feed. Others, like this little fella, created quite the ruckus, squawking and flapping their wings wildly and lifting their heads to the sky. Our guide explained that this odd ritual was how the mating penguins recognized each other. 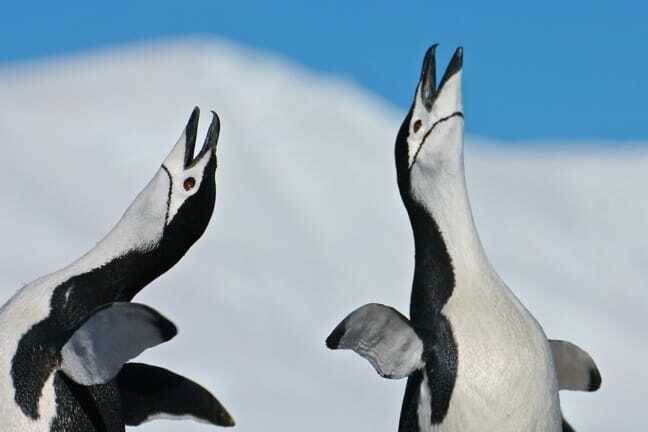 Each penguin’s call is unique, so they would raise their heads and squawk comically until their mate recognized them. Once the pair was reunited, they did an odd little dance where you weren’t quite sure if they would kiss or fight. Eventually they would settle down into a nest made of rocks, which the males would bring to their partners. We were fortunate in that we got to slide back down the mountain at Orne Harbour, and we’ll have a fun video of that coming soon. 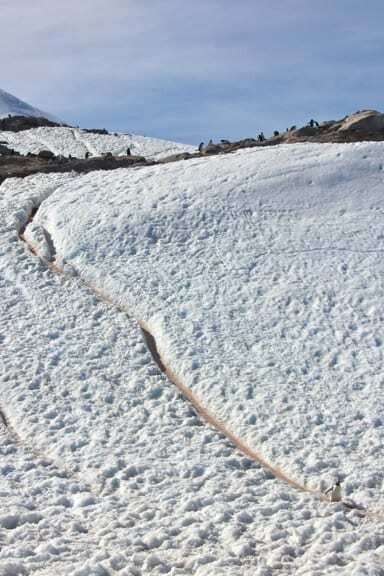 But the little penguins weren’t so lucky: They created little highways through the snow for themselves, and every day they would take these same paths up and down the mountain to go in search of food. If you happened to be on said path when they were trying to cross, the penguins looked VERY confused. 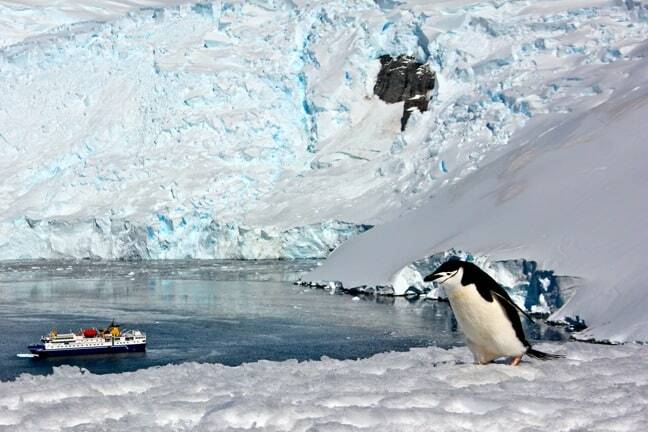 In these situations, the penguins always had the right of way. Though their waddling movements on land were often amusingly clumsy, the penguins of Antarctica are truly a sight to behold once they reach the water. We had an excellent opportunity to watch them rocketing through the shallows of Neko Harbour, and had many chances to see them “dolphining” out of the water. 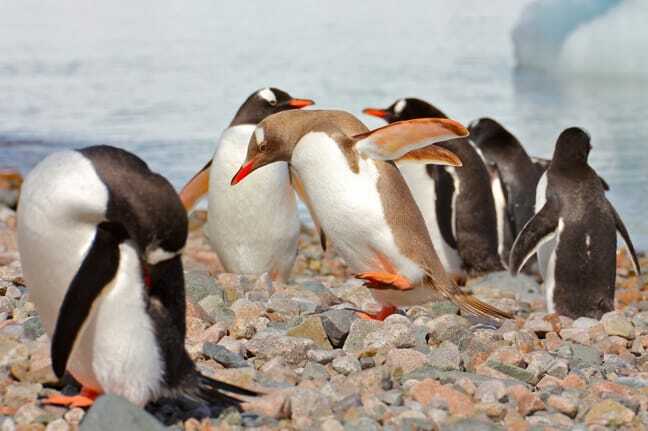 The colony of Gentoo penguins pictured here went out in search of their favorite food, krill, and were forced to swim around until the tide grew high enough for them to get back on land. Arguably the coolest wildlife sighting of our entire trip was this extremely rare albino penguin. While most of our fellow passengers went up to the Neko Harbour viewpoint, we stayed on the beach, where a colony of penguins was gradually waddling across the rocks within 3 to 4 feet of us. Suddenly we saw this brown-backed beauty, and began snapping photos like crazy. 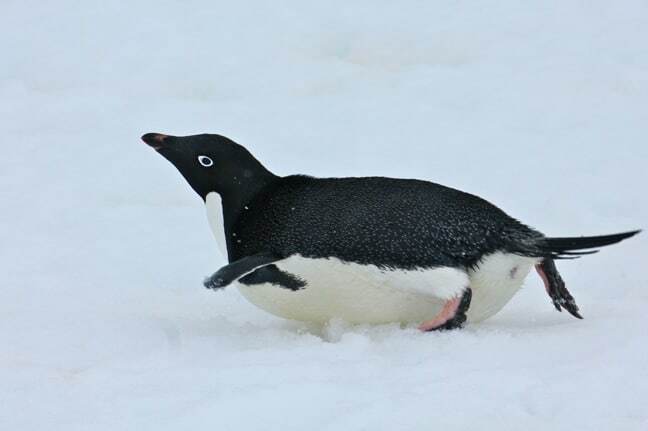 Our guide, who had been visiting these islands every day during the tourist season for over 15 years, said he’d only seen one penguin like this before. So we felt extremely fortunate. According to a story in National Geographic, the penguin is not truly an albino. 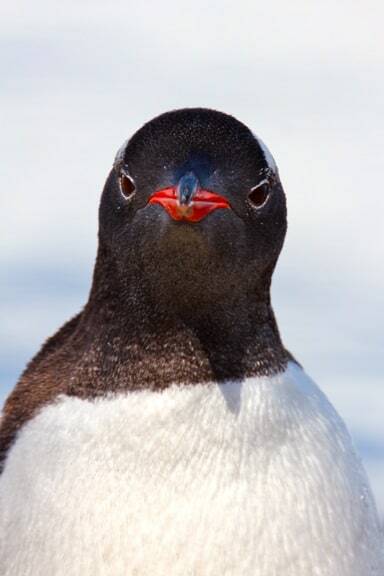 Referencing a 2009 study published in Marine Ornithology, penguin expert P. Dee Boersma of the University of Washington calls the condition isabellinism. 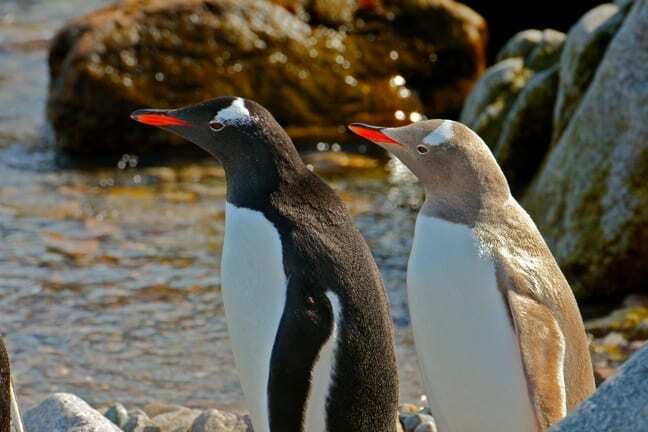 This genetic mutation dilutes pigment in penguins’ feathers, turning them a grayish yellow or pale brown. Regardless of what you call it, the results were uniquely gorgeous, and we took dozens of photos of this rare beauty. We also got our first opportunity to see penguin eggs up close. 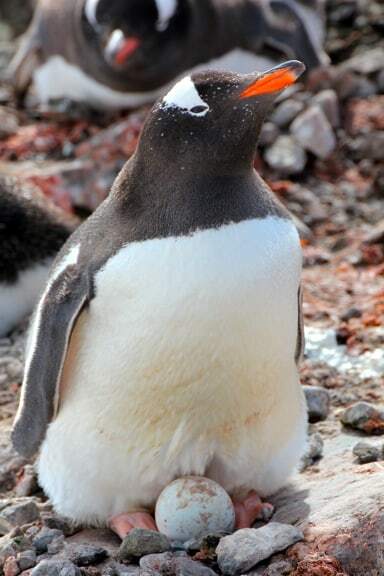 This Gentoo Penguin mama wasn’t having to keep her egg warm (as famously featured in the film March of the Penguins), since the temperature was a balmy 39 degrees. But you can see here how they use the nest of rocks to keep the eggs from rolling off their perch. We were sad to see a few broken eggs in the vicinity. 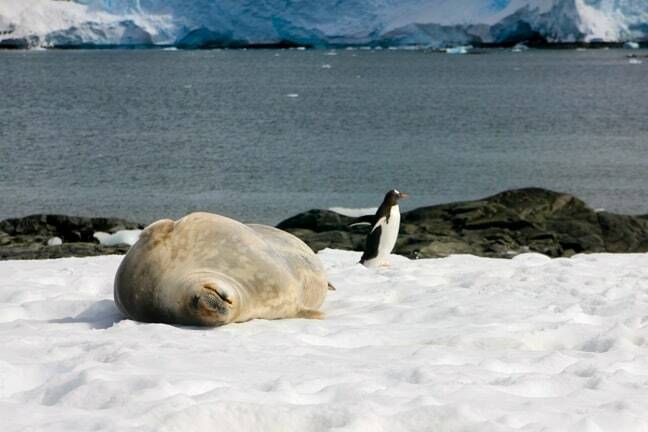 We didn’t see much in the way of inter-species interaction in Antarctica, so it was surprising when this Gentoo Penguin waddled within a few feet of a sleeping Weddell Seal. Although they prefer fish, squid and krill, these seals have been known to eat penguins on occasion. Luckily, this plucky penguin made it out alive. The bad news on our last day in Antarctica was that a snowstorm came in and delayed our departure by a day. The good news was that we visited Ardley Island, where we finally got to see baby penguins! We also got our first chance to see Adelie Penguins, which are easily recognizable due to their all-black heads and striking white eyes. 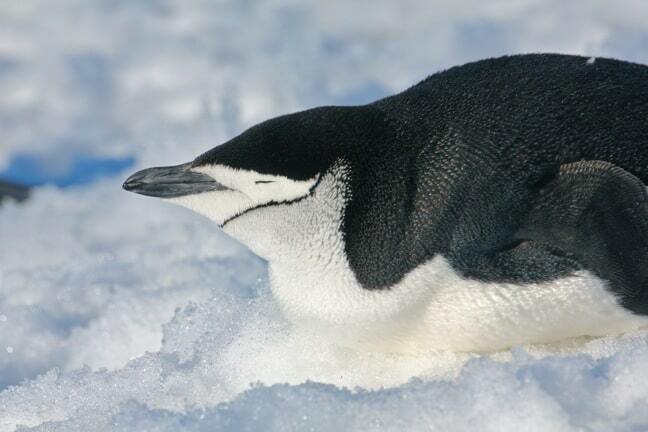 The Adelies (the only penguins of Antarctica who travel on all fours) breed in rock-strewn nests from October to February, laying two eggs that are incubated for 32-34 days, with each parent taking 12-day turns. The chicks usually remain in the nest for about 3 weeks before joining crèches. By the time they’re 50-60 days old, the chicks have molted into juvenile plumage and gone out to sea. We were blessed with another rare sighting at the end of our visit to Ardley Island. 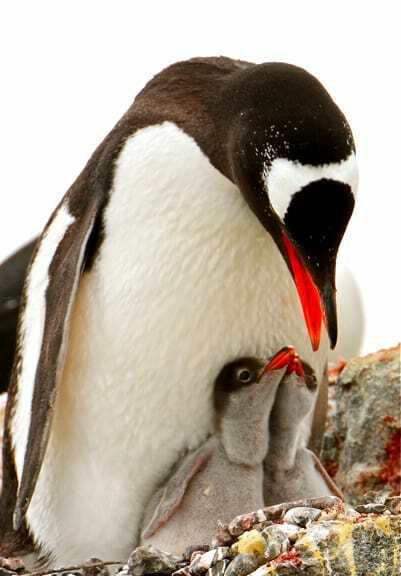 This mama Gentoo had two baby chicks (usually only one survives). After waiting more than half an hour in the freezing snow and watching as they slept, we were greeted by the sight of the twins waking up and begging to be fed. Our trip to Antarctica was hosted in part by Adventure Life, a company of travelers with a passion for sharing the world with others. Visit their website to learn more about their Antarctica Tours.